The hair sponge, also known as the curl sponge, is the best way to twist or curl your natural hair. This tiny, foam sponge can be used to create the most defined curls and twists in no time. 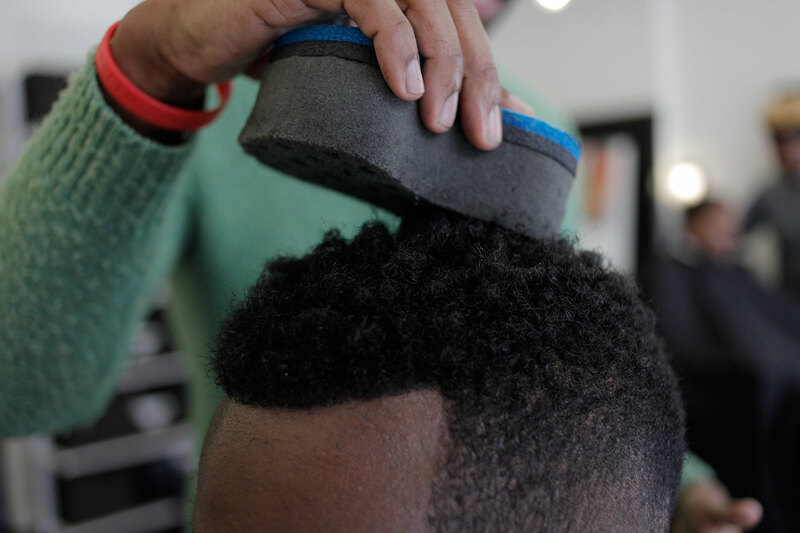 Men and boys can achieve fresh, hip curls in a matter of minutes with this sponge. 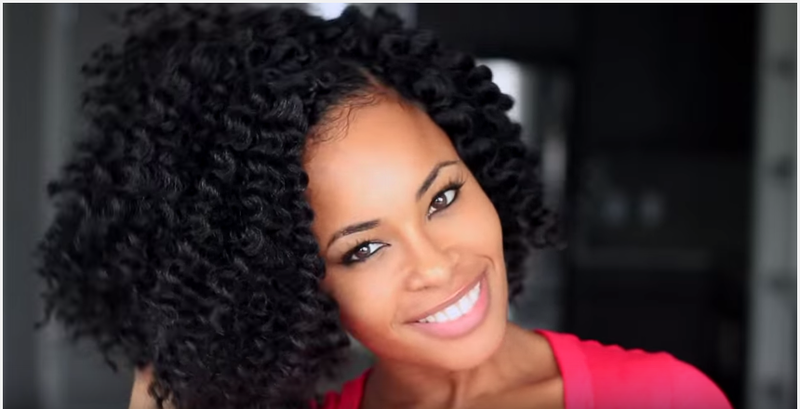 Women with short hair can also use the curl sponge to attain gorgeous, bouncy curls. 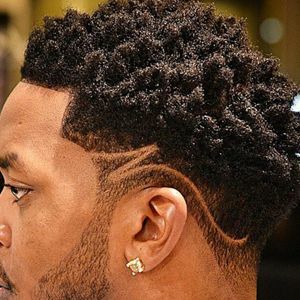 Be part of the latest trend, and greatest way to achieve a cool, curly cut – check out this list of the best hair twist sponges brushes in the market. Creating curls or twists throughout your Afro-textured hair can quickly be accomplished. Moisturize your hair with water, conditioner, or pomade before curling your hair. A curl sponge works best on hair that is moisturized and at least one inch long. Next, run the curl sponge on your hair for 1-5 minutes in a circular motion. Be sure the circular motion goes in the same direction throughout your hair. For example, if you use a clockwise circular motion when you start curling your hair, continue to use a clockwise circular motion throughout the curling process. Continue this process until you achieve your desired look. Apply pomade to your hair to keep your style fresh throughout the day. Different curl sponges have different size holes to create small or large curls. 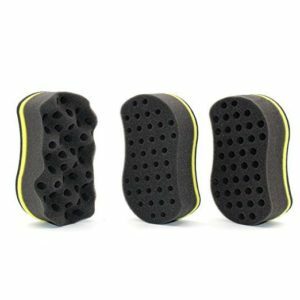 Be sure you purchase a curl sponge with large holes for bigger curls or small holes for tight curls and twists. 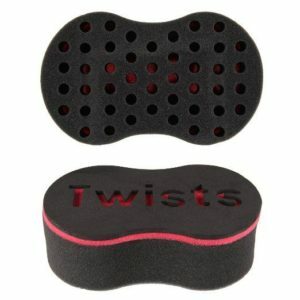 The Twists Magic Barber Sponge is one of the most affordable curling sponges with high-quality results. The holes in this sponge are deep and work well for dreads. 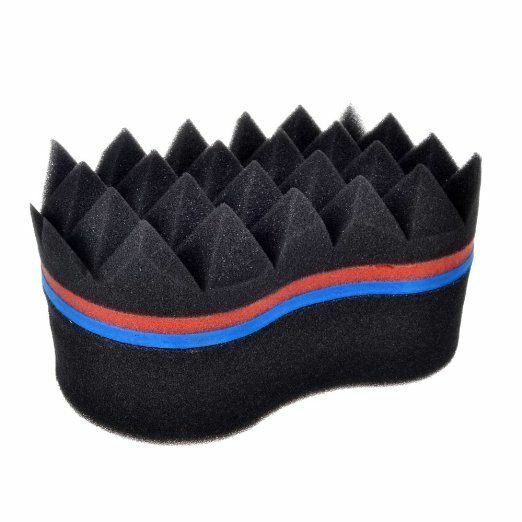 Add more texture to your hair or let your natural curls be more defined as you use this curling sponge. Use the double-sided magic twist hair sponge as your hair grows longer. A premium styling tool, this two in one curling sponge works on Afro-styled hair as well as dreads. 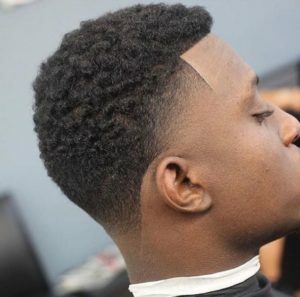 Achieve the same look you receive at a barbershop with this cool styling tool. If you desire to have smaller curls throughout your Afro, the Chérir Premium Hair Sponge is perfect for you. Tiny 7 mm holes are spread throughout this curling sponge to ensure tight, hip curls. The high-quality materials this sponge is made from allow it to last longer than other curling sponges. If your hair grows quickly or you prefer to have various styles throughout the week, this 3-piece magic twist sponge kit from Sinsun is a good tool to purchase. One curling sponge has 8 mm holes, and another curling sponge has 10 mm holes. The third styling sponge has foam waves for defined and textured dreadlocks. A magnificent hairdo can be achieved with this new pyramid design hair sponge. The pyramid side is best for larger Afros or longer hair. The side with the circular holes is great for short hair. A new, hip style is achieved with this innovative curling sponge. This Magic Barber Shop sponge brushis wonderful for styling curls and twists throughout an Afro. You can also start dreads with this curling sponge. 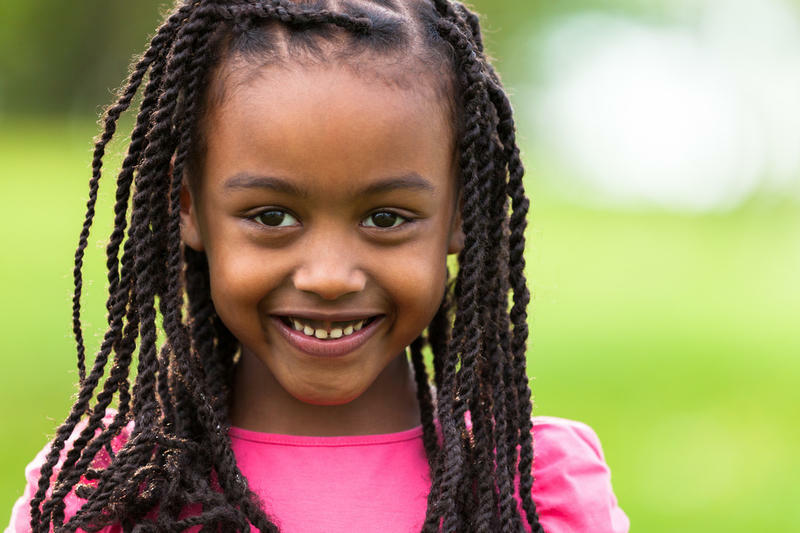 Mini dreads or twists can be achieved in minutes. 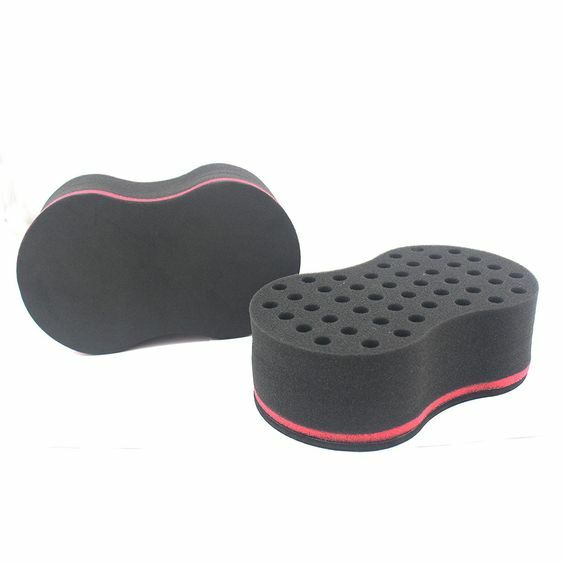 The thickness of this hair sponge makes it different from other styling tools with similar effects. 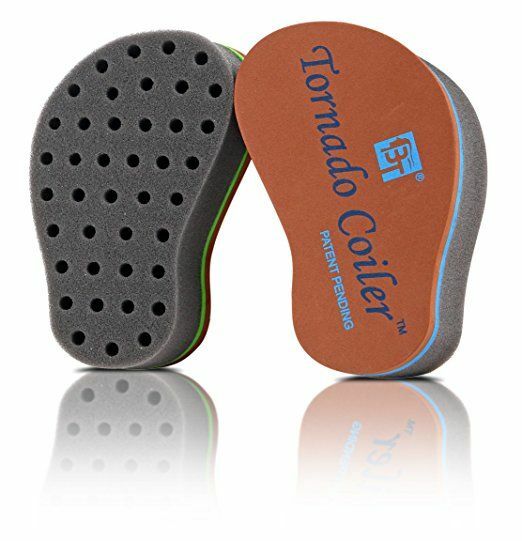 The Tornado Coiler is a cut above all other curling sponges. 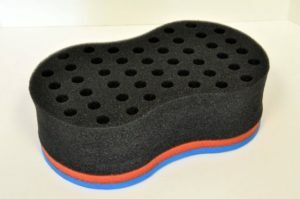 The top is hard which allows you to grip the sponge better as you create circular motions throughout your hair. Smaller, more defined curls are achieved with the Tornado Coiler. The Tornado Coiler styling tool can be used every day for a hip look. 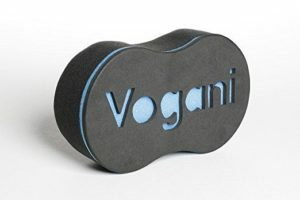 Revolutionizing styling tools, this Vogani hair sponge brush creates professional hairdos in a matter of minutes. The uniform 7 mm holes are placed in a pattern to ensure perfect spacing for hair twists. 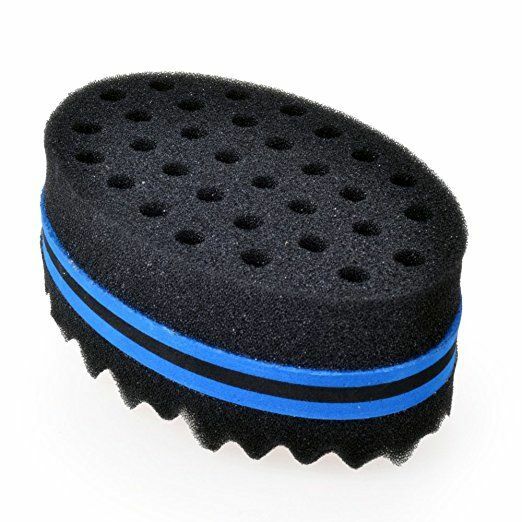 This sponge brush is durable and sturdy, which is perfect for creating curls throughout your hair. 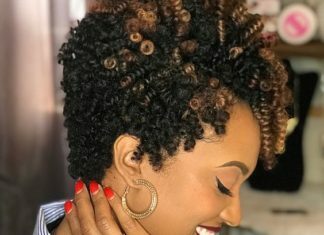 Effortlessly create curls, coils, locs, or dreads with this unique hair twist sponge. 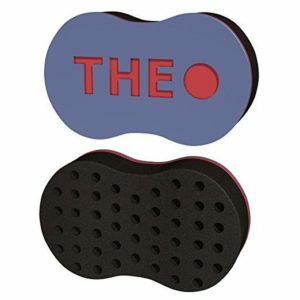 TheO curling sponge is made from high quality, eco-friendly material. A large surface with deep holes has been created to accommodate various lengths of hair. 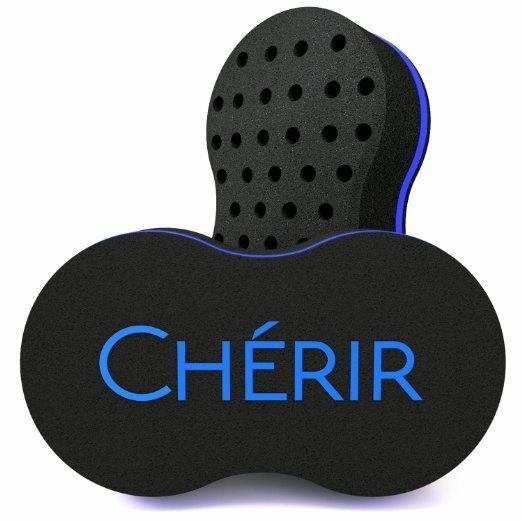 Men or women with type four hair would benefit from this curling sponge. The Purenight barber sponge brush is one of the best styling tools to take when traveling. This sponge brush is affordable and will style your hair in minutes. 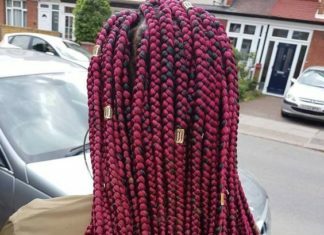 The holes add texture to your hair and can be used on dreads or an Afro. Add textured curls to your edgy Mohawk hairstyle. 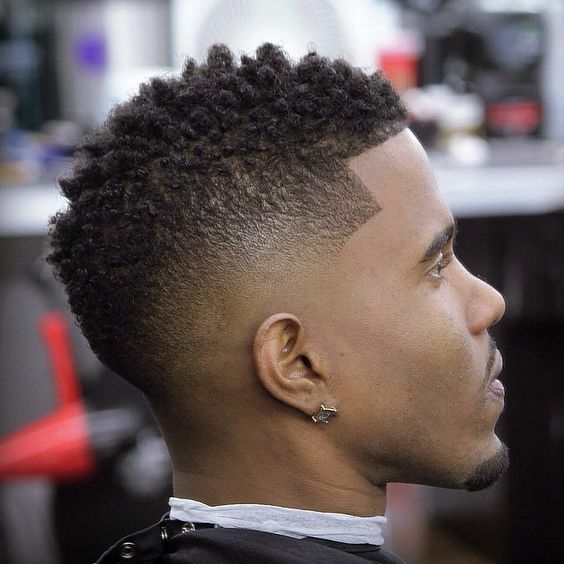 A Mohawk cut is a hip, cool ‘do that sets you apart from the rest. 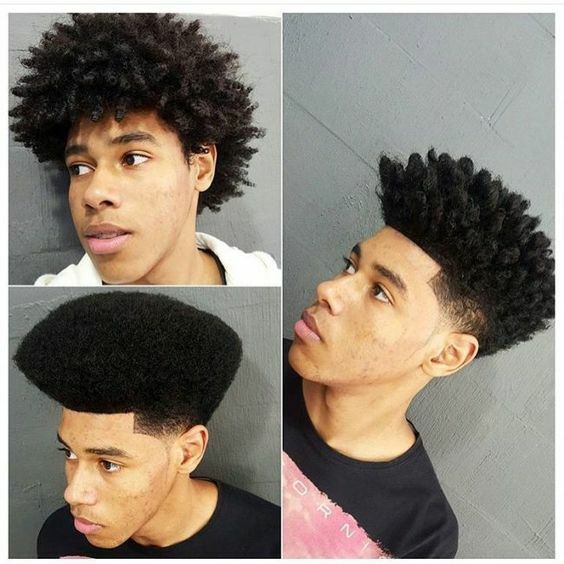 Using a curl sponge on your Afro hair creates a fresh, new style. A line-up cut creates a handsome look. 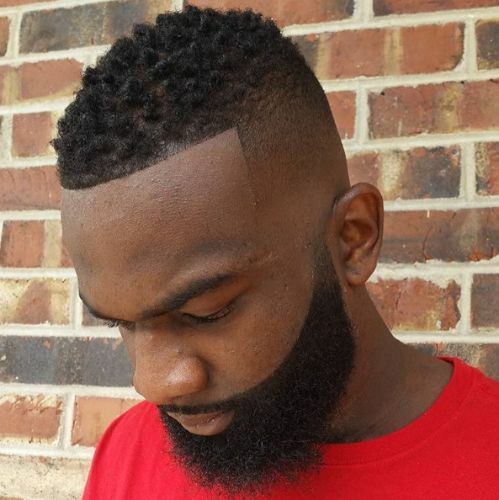 Incorporating your facial hair with your hairstyle is a popular trend. 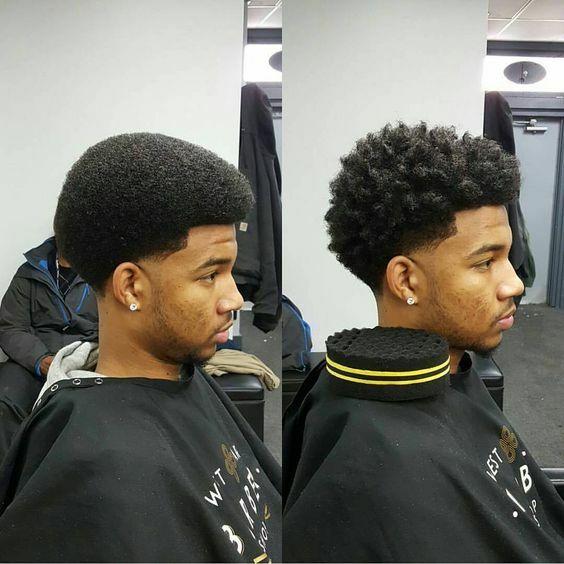 Create curls throughout your long Afro for a funky, fresh ‘do. If you have short hair, you can still create a hip ‘do with a curl sponge. 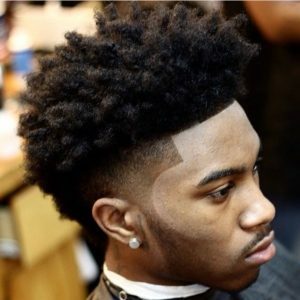 Add tight curls throughout your small Afro for a cool style. 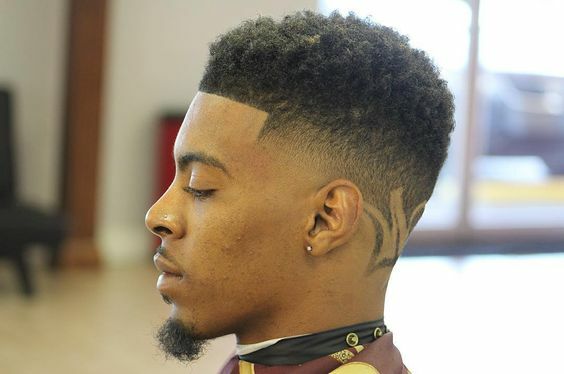 A temple fade completes this popular look. The temple fade cut is a dapper, classy cut to wear. 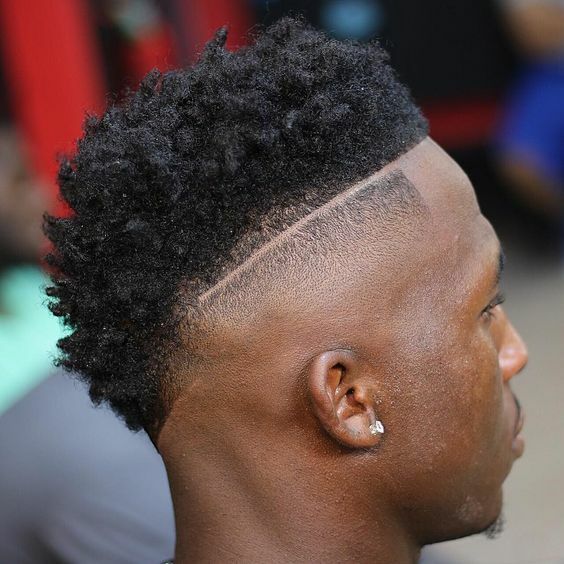 The razor part in this ‘do adds edge to an already hip cut. Designing curls with a sponge brush throughout the hair on top creates a fresh vibe. The high-top fade is a cut reminiscent of the ‘90s. 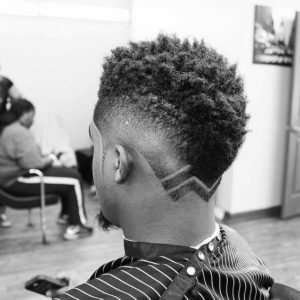 Add a modern touch to the high-top fade by creating curls throughout your Afro. This ‘do takes the style a step further by incorporating a shaved design. 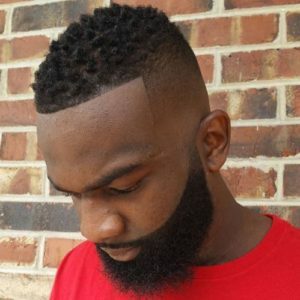 A debonair look is created with this hair sponge and beard cut. Put on your best suit and tie as you don this ‘do for the next formal event you attend. Look ever so dashing as you exude a sense of sophistication. Sponge curl cuts allow you to style your Afro textured hair in various ways. A sleek look is created with short, tight curls throughout the hair atop your head. Wear this cut to the office or for a night on the town. Color can create a whole new look when added to your hair. These hip highlights create a fresh, new vibe. The brown highlights are a great contrast with natural, dark hair. Combine this ‘do with a geometric shape for a handsome look. Curl sponges have different size holes for longer hair. If you have a larger Afro, this long twist hairstyle is perfect. 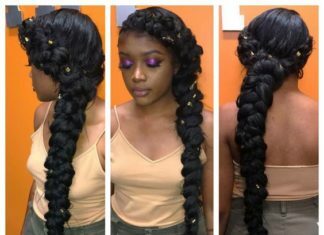 Add longer twists throughout your hair for a super cool ‘do. 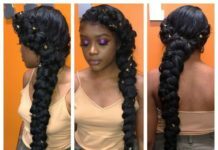 Jazz up your Afro hairstyle with curls all throughout your tresses. A traditional Afro becomes a hip, new ‘do as you use a curl sponge to create curls and twists in your hair. The curl sponge is a great modern styling tool. 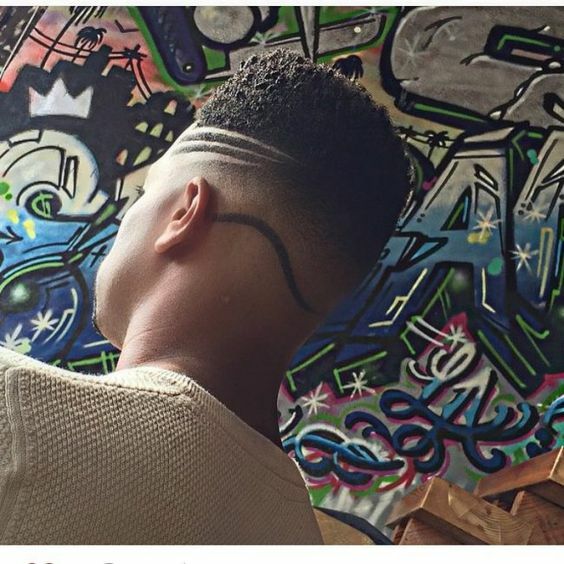 An innovative haircut is created with an amazing pattern designed with razor lines. 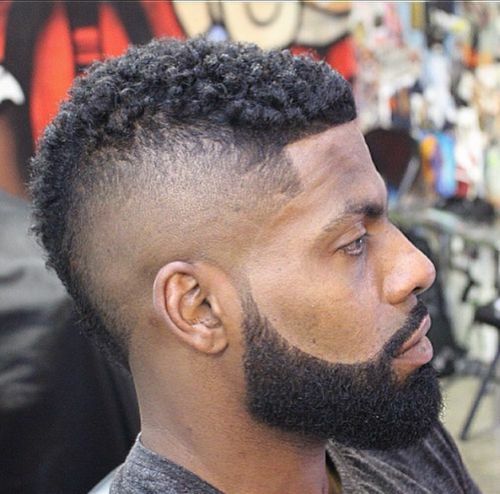 The high, tight sponge curls along with the fade are essential parts of this creative ‘do. 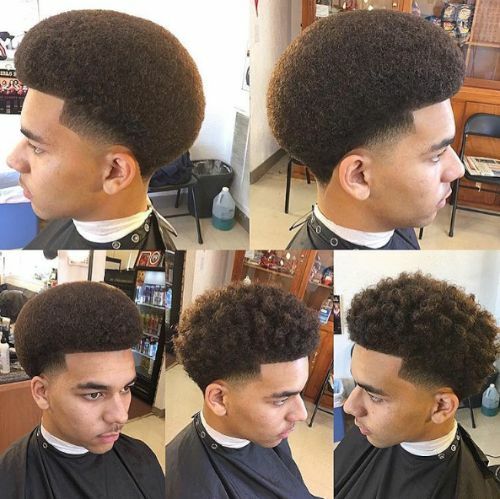 A one of a kind cut is created with cool styling techniques. 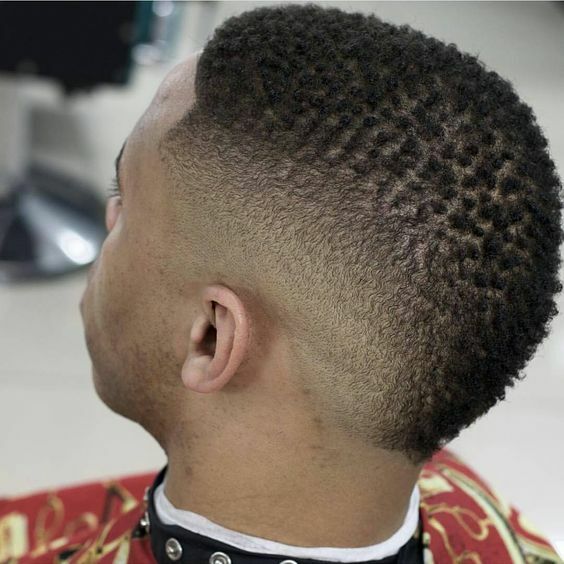 Combine a skin fade with sponge curls for a stylin’ haircut. 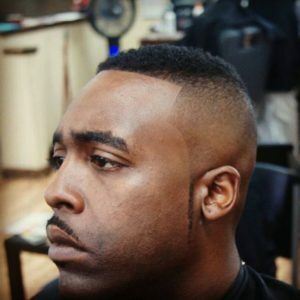 Hair is twisted on top while a lined fade dips down towards the nape. A straight line enhances the contrast between the curls and the shaved sections. 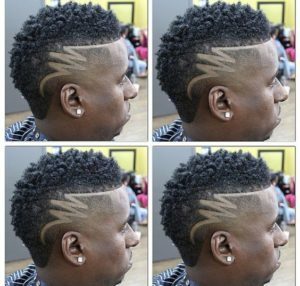 Let your inner rock star shine as you don a fauxhawk with a taper fade. 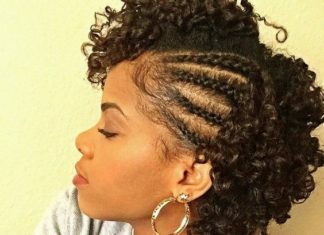 Sponge curls bring this ‘do to another level. 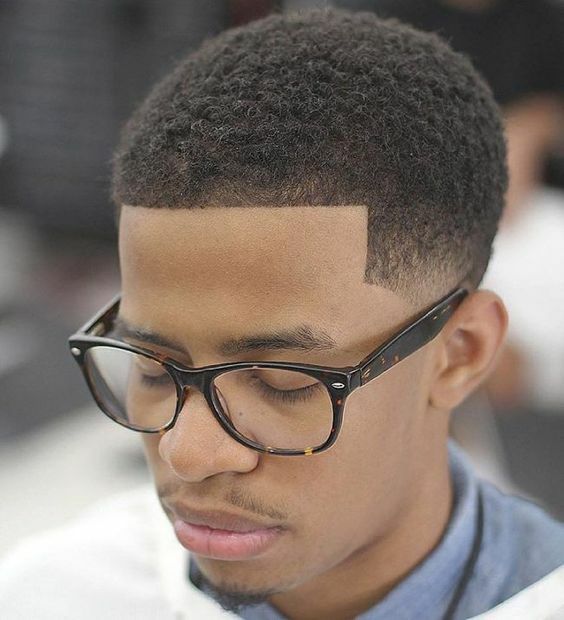 A classy line up cut has a bit of edge as you style curls throughout your hair. An innovative hairstyle is created with this sophisticated two-tone color. The creative cut is a V-shape with a taper and superb razor lines. A winged shape is created at the nape. 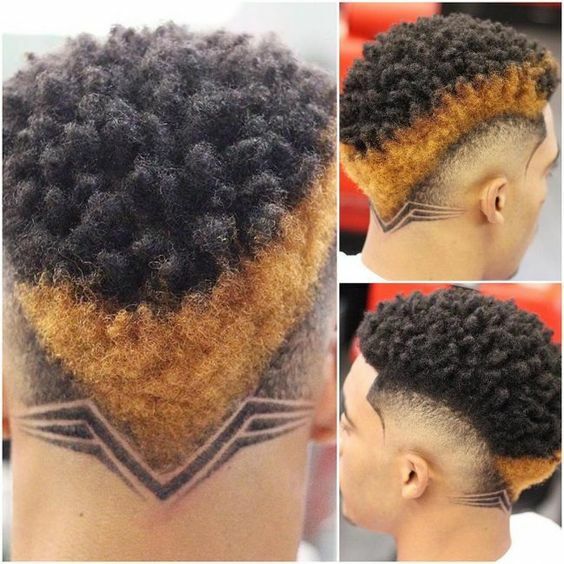 Sponge curls throughout the Afro complete this original look. Small, tight curls can be added to your hair to create a hip, fresh look. The curls in this ‘do are more defined. Create a style that matches your amazing sense of fashion. To achieve this cool look, grow out your natural hair. After you have long strands, create a simple taper fade on the sides. 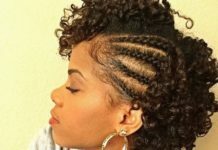 Design hip spirals throughout your long tresses for an awesome look. Create an original haircut as you add shaved designs to the side of your head. Sharp, diagonal lines create a modern, geometric style. Sponge curls shaped into a Mohawk is an edgy look. Short strands can be styled into sponge curls with an elegant, classy look. An awesome taper on the sides and a neat shape up creates an ideal cut for any gentleman. 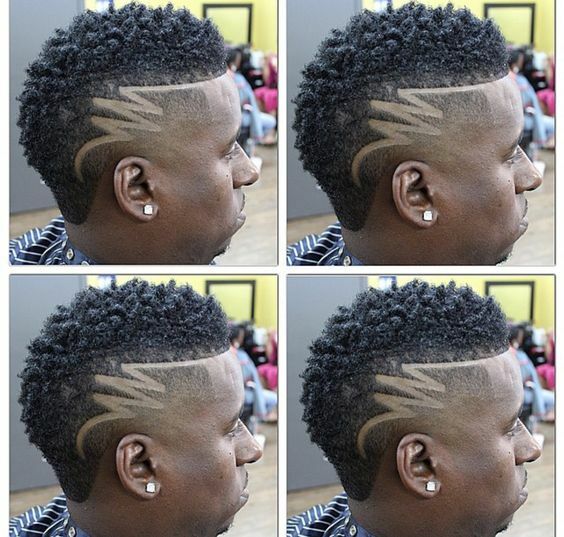 For a haircut with a super cool design, add a lightning bolt. 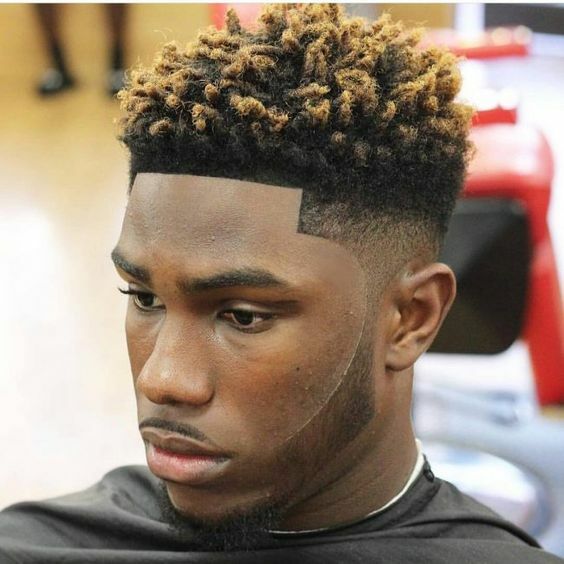 Curly hair sits atop your head while shaved sides create an edgy look. 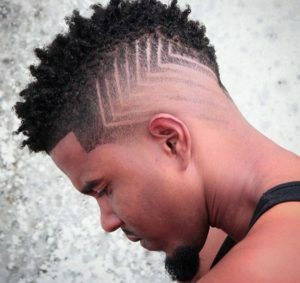 The lightning bolt distinguishes the curly hair from the shaved sections. A simple haircut can allow you to stand out in a crowd. Clean, straightforward curls are designed in short hair. 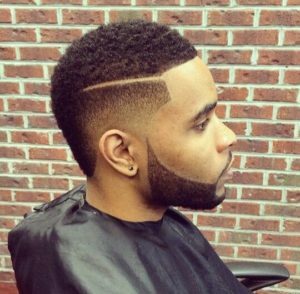 A smooth fade on the sides creates a dapper look.